Ok, let me first start by addressing the title of the blog. There are many creative techniques used when it comes to video storytelling and there isn’t a one shoe fits all approach. The brand, the audience, marketing channels and touchpoints all have a say on whether a creative concept will leave its mark. We need to first understand these things before we can conceptualise ideas that will resonate with a target audience. However, there are notable trends which I believe make a video advertising campaign memorable – At least to me. Now, I’m a sucker for a good story. (Thank you, Netflix!) It’s one of the reasons I run a video storytelling agency. Great storytelling is powerful, it can have impact and it’s an incredibly rewarding process if done correctly. With so much video content out there these days, it’s really got to make me feel something if I’m going to remember it. And that’s one of the key points we need to ask ourselves when we’re creating short-form video content for advertising – Is our idea memorable? Other questions we might consider; Is the idea easy to get? Will the target audience relate? It goes without saying – you can’t bore someone into buying something. Humour is a great way to engage an audience and make your advert stand out. This advert from uSwitch was actually released in 2017, but I only recently discovered it. The memorable character and the silly humour had me giggling. What’s great is that this format is easily replicated with new scenarios and characters as long as the main character is present and the humour remains consistent. Anyone else think AO have lucked out with the fact that there is a mainstream song with their business name in the Lyrics? Regardless their new TV and Cinema ad is excellent. It’s got an interesting story – the sun begins to flicker and eventually goes out, plunging the world into darkness. Turns out the sun is a giant bulb and it’s up to the AO team to deliver and fit the new sun to bring light back to the world. My favourite moment is the sun being wheeled out of a giant box which reads “SUN 174 QUADRILLION WATTS” on the side. Remember those beautiful John Lewis adverts? The one’s with the lovely stories, haunting acoustic music and high-end visuals to match. Yep – style three is the pull on the heart strings drama. There’s two more adverts which I love that both fall into this category. The cinematography in these both these 60 second adverts is excellent and the music choice really heightens the drama on-screen. When I was a child I was asked “what do you want to be when you’re older?”. My response? – A scientist. I don’t recall why this profession appealed to me at the time but I distinctly remember proclaiming that it’s what I want to be. As an adult, I’m no longer interested in science. One of my biggest interests is technology (I was early adopter of the Apple Watch!). My monthly copy of Wired magazine is as close as I get to any science-related news these days. I may have claimed I wanted to be a scientist but It was clear that I destined for a different path. As an eight-year-old, I loved to sing, to dance and to perform. In 1997, my primary school’s choir performed on the BBC’s Songs of Praise for its “Mersey Glory” event at Everton Football Club’s Goodson Park. I still have the t-shirt – It’s a bit small these days. But as a Liverpool fan, blue was never my colour anyway! Other performing highlights of my childhood included a competitive group dance to The Boo Radley’s mid-90’s hit “Wake Up It’s a Beautiful Morning”. There was also that time that myself and four friends dressed up as the Spice Girls (wigs and all!) and performed “Stop Right Now” in front of 500 people at Bootle’s town hall. We were dubbed the “Spice Boys”. I was Baby Spice. If I’m really unlucky my mum will find the VHS recording one day and embarrass me on my wedding day. My love for the creative arts continued into secondary school. I loved art, drama and music. I took up the guitar when I was fifteen years old (a late adoption) and reached a decent level of proficiency. Finally, when I was eighteen I played the role of Margaret Mead in the school performance of 60’s rock-musical “Hair”. A female role traditionally played by a man…right up my street it would seem. These days, at thirty years of age, filmmaking and storytelling is how I satisfy my thirst for the creative arts. Overtime I became devoted to film and I have moved back from being in front of the camera to being behind it. Do I think my childhood experiences have made me a better Director? Perhaps. What’s important however is to never let go of the spirit that drove me as a young performer. It should drive everything I do in life and in business. So, when just over a year ago my partner asked me if I’d like to take up ball room dancing my eyes lit up, my heart fluttered. Here was a chance to be that young performer again, throw myself into something new, something exciting and rediscover the joys of dance. It’s been an incredible journey so far. Hard work for sure, but great fun and for an hour a week nothing else matters. All of the stresses and pressures of adult life and running a business go out of the window – We just dance and it’s marvellous. Me and my partner got engaged last year and we are working towards a wedding dance but we’ve also taken a bronze ball room exam. We passed with distinction. Vindication of the hard work we have put in over the last year. I wish I had taken up ball room dancing a decade ago. It’s infectious, it keeps you fit and it’s a great way of meeting new people and blowing off steam. But the point I want to make is it’s never too late to get back into something you love or even take up something new. 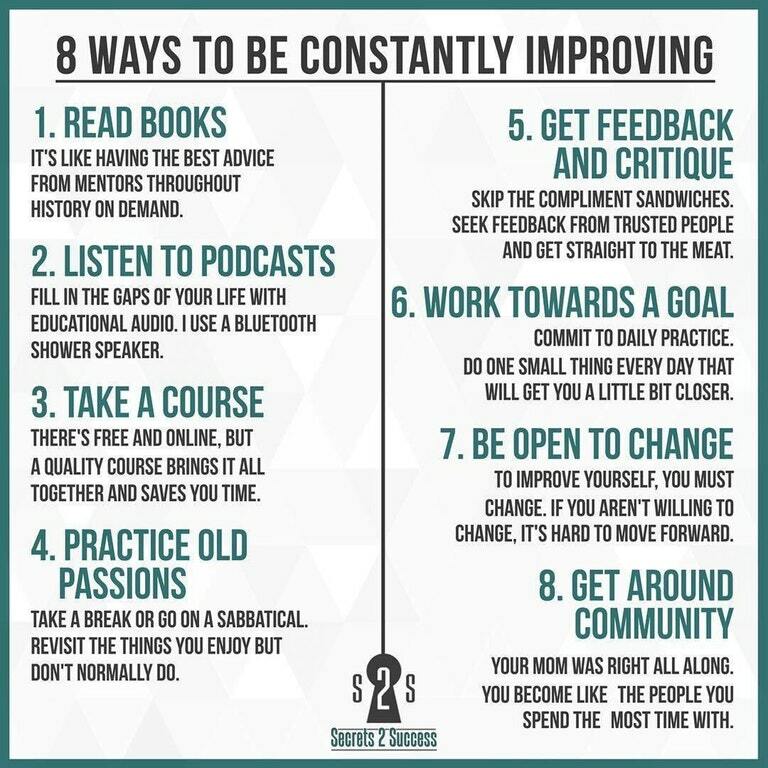 I recently discovered a great little infographic entitled 8 Ways to Be Constantly Improving. Two of the points particularly resonated with me. Point 4 – Practice Old Passions and Point 7 – Be open to Change. As human beings if we’re going to lead meaningful lives both personal and in business then it’s important to revisit the things we enjoy but don’t normally do. For me that’s my love of dancing. And to be constantly improving you must possess a willingness to change in order to move forward. I challenge anybody that reads this article to go out and rediscover an old passion. Or better yet, try your hand at something you’ve always wanted to do. I bet how you look at your work life balance will change for the better. Through my business I try to get clients to challenge why they do what they do. What old passions drive their cause, what do they enjoy? Focusing on these things will help drive their businesses forward. I’m always open to meeting new people and discussing their passions and what underpins their business. If you want a little friendly advice get in touch with me and we can meet for a cuppa’ and a chat. Anthropomorphism is the process of giving human characteristics to inanimate objects, animals and plants. Technology advancements have allowed marketers to use computer-generated imagery (CGI) to develop new and innovative campaigns that can form a warm connection between the advert and viewer. Viewers seem to be a lot more receptive to an animal with human characteristics promoting a service or product than with human-beings. This is where anthropomorphic storytelling comes in. 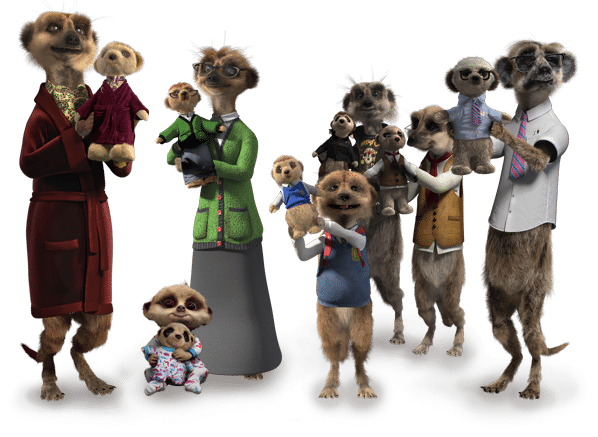 A prime example of how successful a marketing campaign involving anthropomorphic characters can be is Comparethemarket.com’s Russian meerkat family. 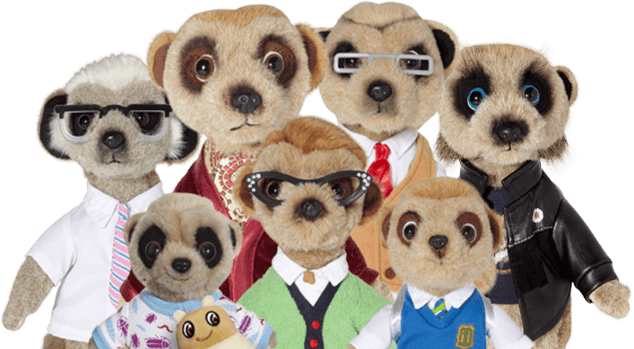 Compare the Meerkat marketing campaign launched on 5th January 2009 and is still going strong today. The television adverts feature Aleksandr Orlov, a CGI anthropomorphic Russian meerkat, with his family and friends. Comparethemarket.com were soon seeing a fantastic return on investment, with it’s site becoming the fourth most visited insurance website in the UK, up from 16th in 2008. Furthermore, after launching the advertising campaign the company’s sales doubled. Along with the television adverts, the campaign has grown further through the years. In October 2010 Aleksandr Orlov released his own autobiography, much to the public’s excitement. The book reached second place on the Amazon UK website on its first week of sale. And in July 2011 the company began production of cuddly toys representing each of the meerkat characters. A cuddly toy was given to every customer who bought an insurance policy through their website. Receiving a cuddly Orlov and Family toy was seen as a quirky incentive to use Comparethemarket.com. There are other companies too who have successfully included anthropomorphic storytelling in their marketing campaigns. 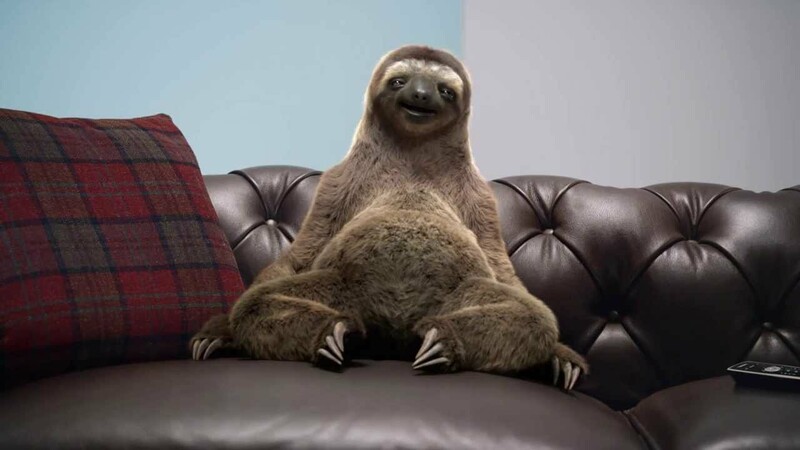 Sofa retail chain Sofology, once Sofaworks, now have Neal the sloth who is the face of the company. Sofology also now offers a free cuddly Neal toy with every sofa purchase. From personal experience it really does work. We went into a local Sofology store just to see if we could get a Neal toy on its own. A couple of visits later we left with a sofa and two Neals! A survey carried out by Promotional Products Week found that the UK is a nation of freebie hunters who will change brands for a free gift. The survey found that 3 in 10, of 1000 men and women asked, purposefully changed from their regular brand to receive a freebie. 34% said that they would be persuaded to change brands if there was a free cuddly toy on offer. Is it because the toy is free that people are attracted to Comparethemarket.com or Sofology? I believe our affection and desire for these characters runs far beyond our need for a quick freebie. The cuddly toys are representations of animals that share the same human characteristics as us. Because they are anthropomorphic characters with personalities and emotions of their own, viewers can form their emotional connection’s with Neal and Aleksandr. They are like familiar, reoccurring friend’s. Our affection is a result of clever storytelling. It gives the characters personality while moving them away from who they actually are: animals. Neal does not hang from a tree in any adverts, but instead he likes slouching on the sofa as we would at home in front of our own television sets. These human characteristic’s, effectively conveyed through the adverts, makes the viewers feel that they are more than just a CGI character and toy. They are relatable and more personable than a human could ever be. Every successful marketing campaign starts with a great idea and a great story. If you want to discuss an idea with us or want some friendly creative advice we are just a phone call away. Get in touch with us to book a FREE consultation where you can discuss your business challenges and goals and how video can fit into your marketing plan. Orange Fox’s new website is live!! Create Film has evolved and we’re pretty excited! We are now Orange Fox Studios. We’ll still be offering the same exceptional service, advice and all round winning attitude, we’ve just grown a little. We used to offer exceptional video production services and we still do! We used to create wonderful animated films and we still do this too! Now, thanks to our growing network of creative talent we can also provide more. Full service visual communications is what Orange Fox is all about. As well as video and animation work, we’ve added two new business off erings to our core skillset – brand & motion design – nice, ‘eh? If only we had some sort of online page which showcased our most recent work and explained all these amazing services in more detail…what’s that? We do?! Orangefoxstudios.co.uk – Our brand new website! But why Orange Fox? Perhaps it’s a metaphor, for the reddish yellow glow of an early morning sunrise, the colour orange represents hope, beauty, and the dawning of a new day. Perhaps we’ve shamelessly jumped on the bandwagon of Leicester City’s extraordinary premiership success in a cheeky eff ort to bag a free season ticket. The truth is we are situated in Leicester – the heart of England and the home of the Foxes. Plus, we REALLY like the colour orange and a non-orange fox would be weird, right!? http://orangefoxstudios.co.uk/wp-content/uploads/2016/09/blog_thumb_sample.png 402 803 Lee Tomes http://orangefoxstudios.co.uk/wp-content/uploads/2017/11/logo_menu_new.png Lee Tomes2017-02-22 13:58:472017-11-05 11:48:51Orange Fox's new website is live!! We are currently working on great project for Haemnet – a network for health care professionals who treat people with inherited bleeding disorders. It is a totally free service that provides a secure online space in which members can share information and experience about the care of people with bleeding disorders. Membership is open to specialist nurses, physiotherapists, data managers and social workers. You can visit the site at www.haemnet.com. The NHS is always looking for new ways to spread public health messages and the project has prompted us to think about how we can take advantage of online video to disseminate healthcare messaging and reach and inform a larger audience. Video is one of the most powerful ways to reach people and if the idea is right you can connect on an intellectual and emotional level. Through a little research we found a useful article on The Guardian online which highlighted a couple of key case study campaigns. The article opens with the reminder of one of the first acts of the coalition government back in 2010, when they slashed government advertising, although they made an exception for two campaigns on dementia and strokes. North Bristol hospital hosts the South West Children’s Burns Centre and has used video to spread awareness of the thousands of children every year who are injured by hot drinks. Their ‘Hot Drinks Harm’ campaign depicts a small boy pulling a cup of tea onto himself while his mother’s back is turned, causing him to suffer severe scalding on his cheek. The aim of the film was to raise awareness of the consequences of leaving hot drinks around children and, using social media, to get it disseminated as widely as possible. Dr Amber Young, consultant paediatric anaesthetist at the centre, says “If you put a bland video up with education facts and figures, people aren’t going to use some of their valuable time to watch that. It’s got to be something that hooks them”. The video, which was created on a budget of £2,500 and used trainees from the City of Bristol college to do the make-up, has gone on to get nearly 14,000 views since it was published in 2011. A year earlier an interactive series of videos launched to encourage young people to wear contraception. Created by primary care trust NHS Bristol and England’s NHS Choices website the video allowed viewers to decide whether a young male party-goer would wear a condom or not, before showing the consequences of his decision, which included pregnancy and sexually transmitted infections. The video received almost 2million views, in part as a result of extensive media coverage after the Daily Mail ran a story branding the video as ‘pornographic’. However, with such traffic, the cost of the videos worked out less than 2p per visit, compared to around £32 for a face-to-face visit to a GP. Another example of NHS video campaigns hitting the headlines was NHS Leicester City primary care trust’s video in May 2009 of a young girl giving birth on a school field. The unbranded video, which was produced to look like amateur mobile phone footage, attracted huge amounts of press coverage and was removed by YouTube after 24 hours after receiving hundreds of complaints. Costing £20,000 to produce, the video targeted girls, young people not in education, employment or training (Neets) and those in the west of the city, a pregnancy hot spot. It had been viewed 2m times by June 2009. Article taken from the Guardian Online. February 2014, weeks away from the Oscars, the most prestiges award in the filmmaking world, and yet i’m not that excited. Don’t get me wrong there has been some truly excellent cinema in the year gone by, watching Scorsese’s adrenaline fuelled epic Wolf of Wall Street was certainty a personal highlight. But it in the words of a recent Ron Burgundy anti-piracy advert the cinema is now the “shimmering pretender to televisions crown”. As James Wolcott of Vanity Fair points out, “when it comes to inventive comedy (Modern Family, 30 Rock), complex heroines (Damages, Weeds), and finely textured drama (Mad Men, Downton Abbey), the action has left the cineplex and headed for broadcast and cable”. “He had a lot of space to build the role—six seasons—and he fully inhabited every corner from the beginning, sometimes as a great comedian, sometimes as a self-pitying monster, but always as a radical and new sort of character for television, one who punished the audience for loving him”. “One cold winter’s evening in January 2002, Tony Soprano went missing and a small portion of the universe ground to a halt. It did not completely out of the blue. Ever since The Sopranos has debuted in 1999, turning Tony – anxiety-prone dad, New Jersey mobster, suburban seeker of meaning-into a millennial pop culture icon, the character’s frustration, volatility, and anger had often been indistinguishable from the qualities of James Gandolfini, the actor who brought them to life. Th role was a punishing one, requiring not only vast amounts of nightly memorisation and long days under hot lights, but also a daily descent into Tony’s psyche-at the best of times a worrisome place to dwell; at the worst, ugly, violent and sociopathic”. The rise in digital streaming services such as NetFlix and Love Film and the falling price of DVD box sets has also contributed to Televisions cause. Back in 2000, when DVDs where in their infancy, you could pay anything upwards of £60 for a single season of your most beloved show. Fourteen years on and you can now purchase the entire six seasons of HBO’s The Sopranos for just fifty pounds which works out at less than ten pounds per season – a bargain for sure! I have to admit I was a late comer to Breaking Bad and with NetFlix offering all five seasons plus many more great TV shows and films for just £5.99 per month it seems silly not to take advantage. The way we consume our entertainment is rapidly changing and evolving – we embraced DVD they same way embraced Blu-Ray, in time we will make the shift to 4K Television and with true HD quality imagery at home and the rise of digital streaming will you want to go to the cinema? Time will tell but until then we will have to make do with the mobile phones, the rustling and the loud-mouthed teenagers spoiling our entertainment. 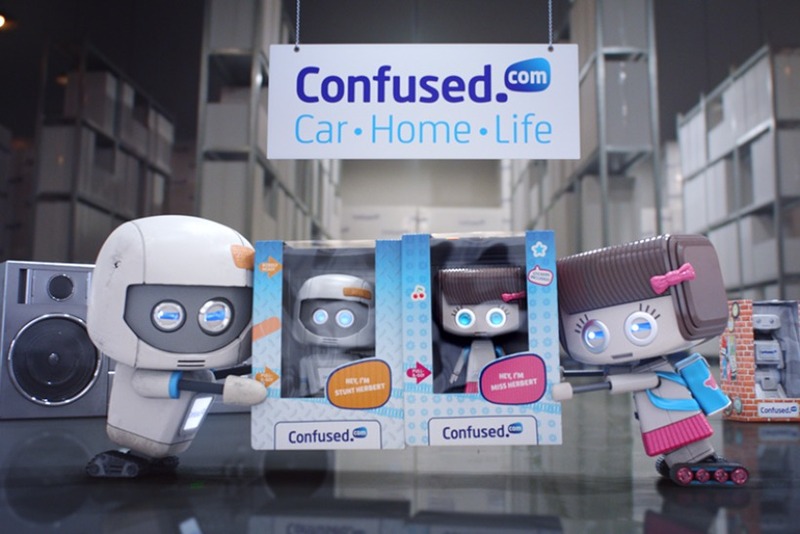 Following on from our Creative Producers article about the ‘The Power of Online Video for Advertising’ post for Business2Community.com we have compiled a little shortlist of five adverts broadcast in the UK that we really like. These adverts are for big brands, produced by agencies handed big budgets, but it is interesting to explore the different methods of storytelling used to effectively represent the brand and engage their respected target audiences. All the elements comer together to make this advert effortlessly cool and shooting in eastern Europe offers a beautiful rustic backdrop for the film to play out. Even the tag line is cool ‘Even Angels Will Fall’. Simply genius design and a long thought out ninth-month process went into putting it together. Six months of planning followed by short segments filmed over fours days and you have one heck of an advert. Honda estimates that worldwide sales rose by nearly £400m on the back of the ad. Much was made about the production team behind ‘Balls’ actually doing this for real and indeed they did. A quarter of a million rubber balls were bounced down Filbert and Leavenworth streets in San Francisco. Accompanied by the haunting vocals of Jose Gonzalez and you have a truly beautiful advert. It’s impossible not to feel good after viewing both of these excellent T-Mobile adverts. The message here is ‘Life is for Sharing’ so get out your phone. Adverts that make you feel good, make you laugh and smile are definitely ones that will live long in the memory. If you like what you see here get in touch below and see what our team can do for you. If you have a story to tell but don’t know how to tell it, we can help.